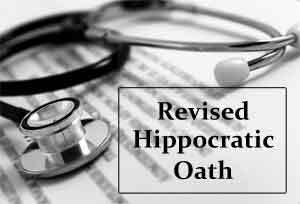 A modern successor to the Hippocratic Oath for physicians around the world has been approved by the World Medical Association.Physician leaders, meeting at the WMA’s annual General Assembly in Chicago, recently approved revisions to the Declaration of Geneva, which was adopted by the Association in 1948. The current Declaration of Geneva is used across the world by physicians. In many countries, it is actually part of the medical professional code and in some, it is legally binding. However, in other countries, it is either not used at all or is adapted in some way. WMA President Dr. Yoshitake Yokokura said: ‘The new wording respects the unique character and significance of this Declaration, but focuses more on important ethical principles not in the current version and not expressed explicitly.The life of physicians today is completely different to what it was in 1948 when the original Declaration of Geneva was adopted. Since then, the Declaration has become a core document of medical ethics and a modern version of the 2,500-year old Hippocratic Oath. We hope that the Declaration approved will be used by all physicians around the world to strengthen the profession’s determination to maintain the highest standard of health care for patients’. ©2017 World Medical Association Inc. All Rights Reserved. All intellectual property rights in the Declaration of Geneva are vested in the World Medical Association. Good. It was long overdue. I see the abortion clause is gone.